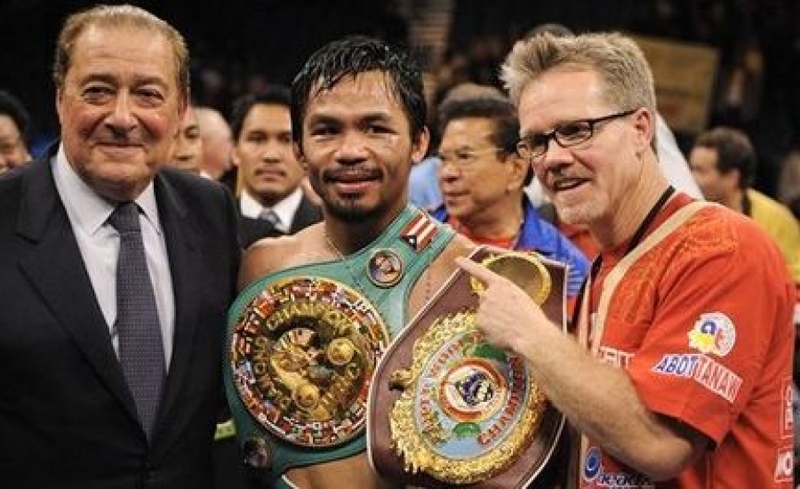 Veteran promoter Bob Arum has made a mercy dash to the Philippines to meet with long-time Top Rank boxer and modern day great Manny Pacquiao in a bid to convince him to re-sign with the 86-year-old’s Las Vegas-based company. Arum arrived in General Santos City on his private jet on Friday according to local newspaper the Phil Star for his sit-down with the reigning WBA welterweight champion and Filipino senator. After losing his WBO welterweight title to Jeff Horn in a close fight in Brisbane, Australia in July last year Pacquiao made changes to his team that including sacking his long-time trainer Freddie Roach. The loss, in front of 51,000 fans at Suncorp Stadium, also appears to have driven a wedge between Pacquiao and his promoter. In his last fight on July 15 Pacquiao used his own company MP Promotions in association with Golden Boy Promotions to put on the WBA title fight between Argentinean Lucas Matthysse and himself at the Axiata Arena in Kuala Lumpur, Malaysia. Top Rank was sub-contracted to handle the international television rights. Pacquiao spoke out on social media about the status of his promotional arrangements late last month. “I, through MP Promotions, will be handling any and all negotiations for my next fight. Nobody is authorized to speak on my behalf. You know my number, call me,” Pacquiao posted on his various social media channels. Top Rank was instrumental in marketing the Filipino firebrand to the American public after an initial bidding war in the wake of Pacquiao’s impressive USA debut against Lehlo Ledwaba on a Murad Muhammad-promoted card in June 2001. Pacquiao stunned the long-reigning IBF super bantamweight champ, stealing the spotlight with his one-sided six-round drubbing of the South African from Oscar De La Hoya in the main event against Javier Castillejo at the MGM Grand in Las Vegas, Nevada. RingNews24 reported yesterday that leading British promoter Eddie Hearn is in negotiations to add Pacquiao to his growing Matchroom Boxing stable with a view to using the 39-year-old former eight-division champ as a drawcard for his deal with streaming service DAZN.